Livesay's pop influences are all too obvious. Taking its cue from the Beatles, Sheryl Crow, John Mayer, Maroon 5, and Train, the album reflects a classic-rock sensibility that draws on radio-ready hooks, well-brewed arrangements, and songs that quickly sink into the consciousness even on first hearing. The title track strikes an immediate boisterous impression, while the sentimental ballad "I Waited Too Long" tugs at the heartstrings. What's more, the band's remake of the Byrds' "My Back Pages" is a close contender for what may well be the best cover of this classic ever recorded. Led by Billy Livesay, longtime lead singer and guitarist for the late Clarence Clemons’ band Temple of Soul, whose soulful, smoky rasp and vocal range are nothing short of killer, the group has recorded their latest album, “Rose Colored Glasses,” released by Echo XS Entertainment. Twelve of the thirteen tracks are written or co-written by the singer, with one cool cover – Dylan’s “My Back Pages.” This record oozes talent, from the solid musicianship to memorably commercial melodies to dead-on rock arrangements by Livesay. First thing that’s clear here is his story-telling ability. This raconteur knows how to wring emotion out of every sung syllable, and his lyrics are a-bloom with imagery. In “I Waited Too Long” – a moving tale of regret – Livesay brings us into his world: “I tilt my head when I look in the mirror/I look like my father or so I’ve been told/I wanted to see him, reach out and touch him/But I was a secret and that was so long ago.” A tortured electric guitar and music breakdown on the final chorus, as well as not-so blatant, ticking clock-like drumming, all add to the drama of the scene. Eddie Zyne on drums, Jorge Laplume on bass, Cuqui Berrios on Hammond organ and Tim Murphy on piano round out this dynamic rock band. 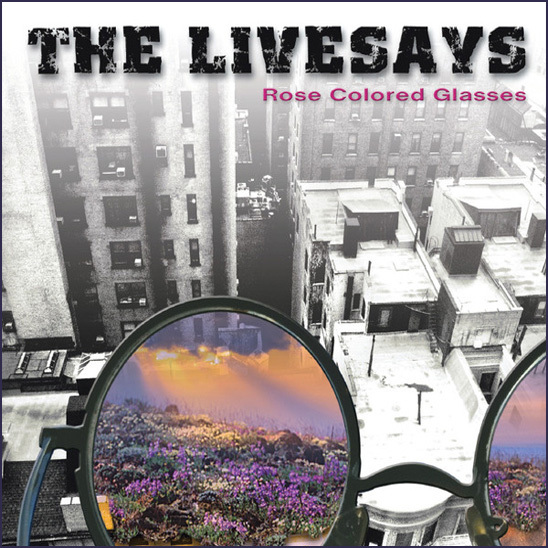 “Rose Colored Glasses” ought to be on “Best Of” lists everywhere.